Today we are proud to introduce you the founder and owner of a couture bow- tie label that combines custom designs with luxe materials such as leather and metal. 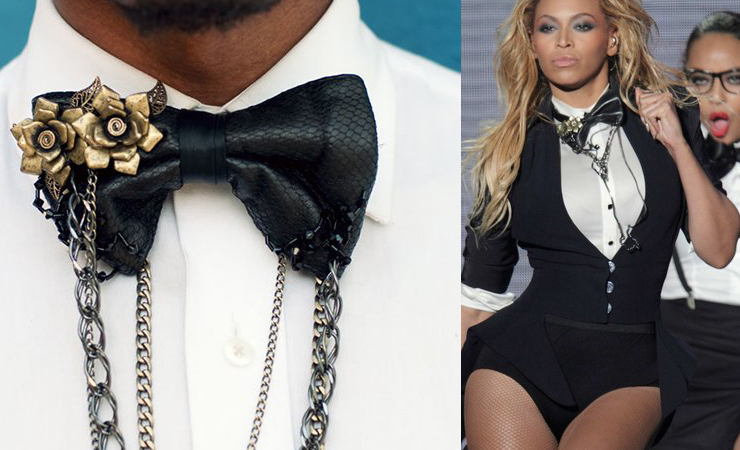 His unique bow-ties are getting more and more popular among celebrities and fashion icons throughout the world. 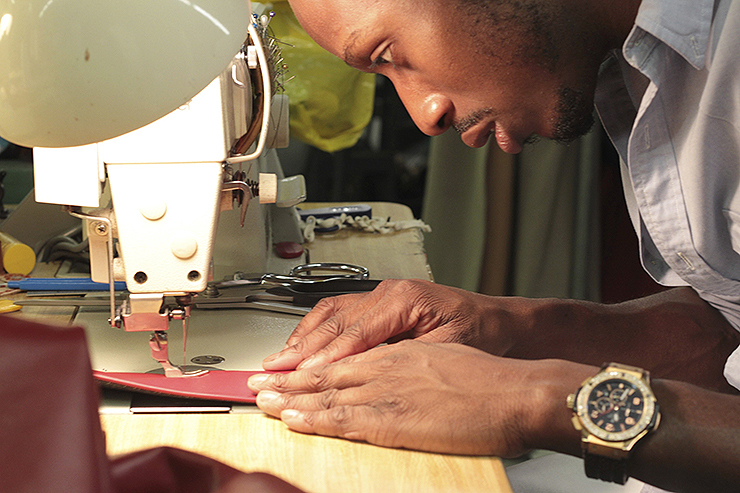 The Fashiongton Post: Chris, what has your career of a fashion designer started from? How long have you been a designer? Christopher Chaun: My career as a designer began during my childhood – dreaming boldly, being extremely curious, and very hands-on. It was never a surprise to find me building or disassembling things. I began my hand at design in a high school course I was sort of interested in, but continued consistently in 2009 with my premiere line. F.P. : What other experience do you have in the fashion industry (stylist, retail, marketing, etc.)? C.C. : The professional experience with clothing began in street-wear retail. Shortly thereafter I landed a position at Ralph Lauren where my hand was at most in-store roles. The general manager wanted me to learn everything about the way the business ran, thus placing me at the register, in shipping & receiving, at the door to greet clients, and ultimately sales. Three years in, I began selling exotic leather accessories for a small company on the side as I crafted my vision for a fashion publication. After 4-years at RL I was recruited to Valentino where I learned much more about glamour and more about the art of servicing luxury lifestyle clientele. I continued to sell exotic leather accessories and juggled my projects as I explored design ideas. I was recruited from Valentino to lead a new program at a Boston-area magazine where I worked to build fashion presence through advertisement and new content. That transition left my own magazine on the shelf, however all of these experiences contributed to my perspective of the business, operation, development, and design segments of fashion. I was really searching for a path to ultimate artistic expression and freedom. This is only part of the story. F.P. : Why did you decide to change the initial name of your company “Robot and Brucling” to “Christopher Chaun” and what was the story about Bruce Franklin that you started this business with? C.C. : The name change of my initial venture was due to its transformation. As I began to work alone, the need to notify clients and fans of my work about the change became most important. As with many business partnerships, we arrived at a place where it was best for business and our individuality as artists to venture out into our own directions. F.P. : What are the primary and distinctive features of the brand “Christopher Chaun”? C.C. : Innovation, detail, quality, and balance. F.P. : What is the main source of your inspiration if there is any? C.C. : My imagination, which is better when completely unleashed, but typically my imagination and my ideas about the variations in which luxury can be presented. Sometimes it’s an inspiration from things both animate and inanimate. F.P. : Do you have favorite models, stylists, photographers… those you are comfortable and always excited to work with. Or each time it is someone new? C.C. : Colin Brennan shot my first and soon to be released campaign for Christopher Chaun – always excited to work with him – he also shoots me. I have worked with a few models and not enough stylists to comfortably say I have a favorite. As for those I’d like to work with, I have a bit of favor for Naomi, Joan Smalls, Alek, Jessica Stam, and Doutzen Kroes. As for guys, David Agbodji, Tyson, Sean Thomson (again), Tae Jahn Taylor, Rob Evans, and a few new comers. F.P. : What do you think means success in the career of the designer? C.C. : Freedom of expression and accomplishing any of many goals one has set out to achieve with one most important point being successfully connecting to your dream client. F.P. : How do you promote your brand and products? C.C. : Through social media, it’s a major way in which we communicate today. I also connect with people when I’m out and about – it’s very hard to pass a person whom has captured the height of my senses without speaking to them, so I introduce my brand when I see my client. I’ve also been stopped because people see me and know of my work. F.P. : Share with us your recipe against the melancholy, depression, and demotivation! What is the best way to sweep all this away when it happens? C.C. : No matter what you do, remember your moment of promise – we have all had a moment of high-spirit where we received the gift to connect with our most inward self which also beautifully and harmoniously connects with our most outward self. It came in clarity, arose through honesty, and with a great deal of reality attached. It is real, so believe in it – only spirits of negativity will make you feel otherwise. You were created for progress and believed in at your highest capability before conception, so aim high because not only are you capable and “it” possible, but because others are waiting for you to fly so they too can learn about the journey that builds courage and the path travelled to flight. C.C. : A square toe shoe or skulls and other wild symbols. I used to wear skulls, but I’m here to promote life, not death. F.P. : What are some of your favorite clothing stores or websites that you often visit to buy something beautiful for yourself? C.C. : Well, I don’t shop a lot but I do like a few boutiques in Boston, Zappos, and many shops in NYC. I’m not big on being in with trends or the “new”. I sometimes visit boutiques because I have an idea of which designer has what I’m looking for at the time. Shopping happens, I don’t really plan it. F.P. : How and where do you see yourself in four years from now? F.P. : Have you ever thought of moving to another country for permanent residence? If yes, which one would it be? C.C. : Yes, Germany left its mark on me with my journey north on the ICE to visit Berlin. France also immediately won me over with the opulence and detail of Parisian architecture, but I often think of Panama (my mom’s home), Japan, Australia, and many African countries. But since I remember two poems I learned in the 5th grade and love the cultural expression in art, maybe Russia or perhaps Ukraine??? [smile]. Wherever I go the food definitely has to be good. F.P. : Name three countries that you consider as so- called capitals of the fashion world? C.C. : France, Italy, and Spain. Very hard to only name three with Japan in the mix. F.P. 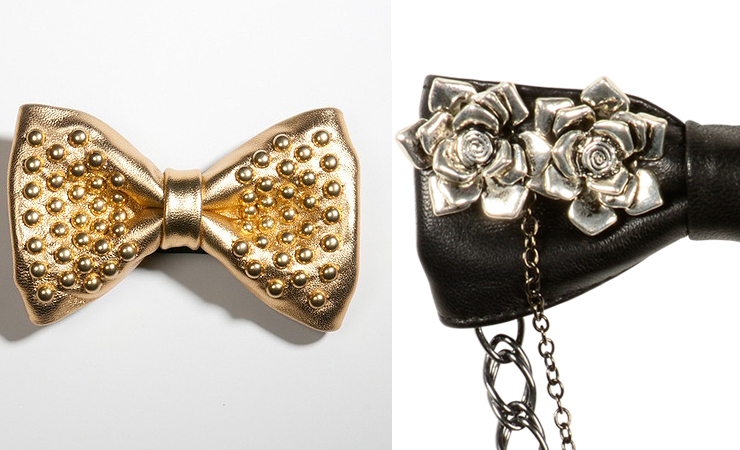 : Your favorite bow-tie from the current collection? C.C. : Finale II and in the soon to release collection, one named French Kiss. F.P. 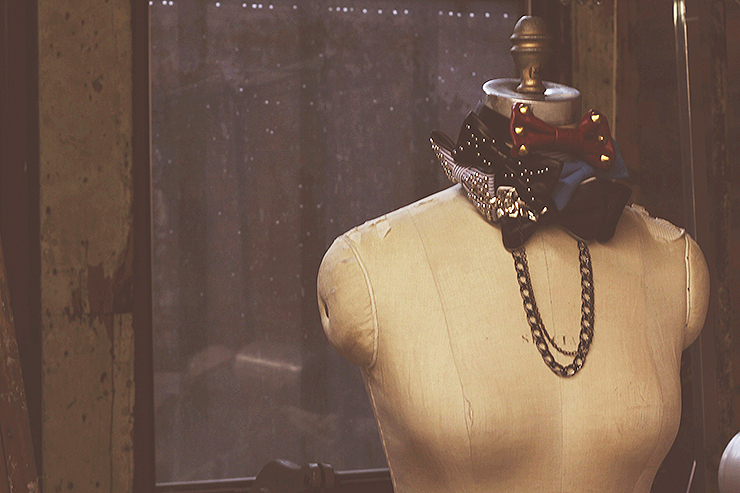 : What would be the ideal choice of the elements of clothes to wear together with a bow-tie? C.C. : Clothes that are balanced in color assortment, tailoring, and design features – a degree of simplicity is a great canvas for some of my bolder pieces. Otherwise a mix that would be complimented by a particular style in the collection. F.P. : A useful piece of advice to The Fashiongton Post and its readers? C.C. : Remember that regardless of what you believe about this life or an afterlife, realize you are here and now is the time to begin doing this one well. We weren’t born with a ticket bearing our expiration date, so let’s get to it and make it all count. Please, live in love.